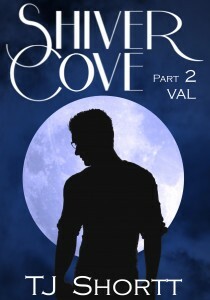 Once I finished the first book, I knew Shiver Cove was going to be a series. I just loved that world too much to leave it. I really liked the idea of doing each book from a different one of the six friend’s perspectives. Val’s story has influences from things that have happened in my actual life. Not to say that anything in the book isn’t fiction, but there are different scenarios that played out certain ways in my life and Val’s book gave me an amazing opportunity to play the ‘what if’ game and see what happened if things happened differently than my life or through a different set of eyes. Normally I sit down and make up a physical description (which I did do this time) and then I answer a bunch of questions I make up until I feel like I know the character. This time was much different, considering how well I know the real-life person I based Val on. In some ways it was very easy and in others it was actually a little tougher writing from the perspective of a real person.